Arrogance Overdrive totally buys into the hype that as a metaman, he's better than most people. Identity After being in prison, its public knowledge that James Proudman is the super criminal Overdrive. Prejudice Overdrive is a mutant, he's also a member of the Cheyenne people. 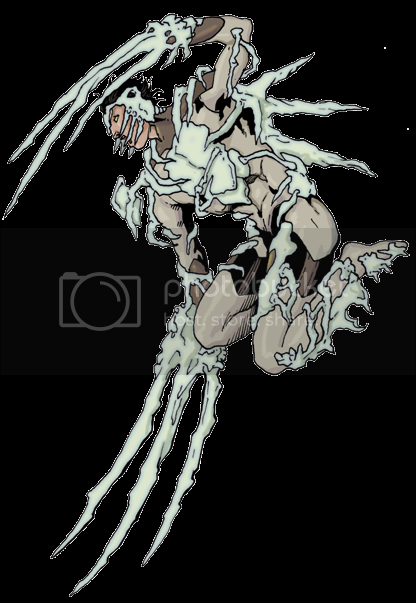 Weakness Overdrive's powers come from manipulating his own "life force", certain energies (like necromancy) can interfere with his powers and damage him more than others. Sloth Overdrive is lazy, and constantly looking for the easy way out. •Overdrive was once just James Proudman, a Cheyenne boy who was just naturally talented at everything. Until the day in highschool when they found out his talents weren't so natural-he was a metaman, using his power to enhance himself. Humiliated and shunned, he became a criminal, and was soon the supervillain Overdrive. Unfortunately, he was betrayed by a fellow criminal and arrested by UNISON. Shortly afterwards, he was freed when Kinematik raided the superprison he was in, and joined the man's cause. Since then, he's stayed by Kinematik, being a perfect number two-able to wear any role well, but with very little ambition or drive of his own. •Overdrive's abilities weren't too tricky, once I figured out how I wanted to do it rather than just re-use 2E's "Wide" Extra. Typically, he'll adopt Strength, Fighting, and Stamina, with any points "left over" dumped into Speed and Intellect. If he knows he's not going to be doing any fighting, he can become very intelligent and charismatic, but since he's so lazy, he'd prefer to just beat people up because its usually faster. A neat little character who works great as a villain because of his whole "anything you can do, I can do better" thing. Secret His true identity as Raimundo Alvarez. Arrogant Fossil believes superhumans to be naturally superior to normal humans. Wanted Fossil is a dangerous mutant criminal, known and hunted by heroes and law enforcement agencies. 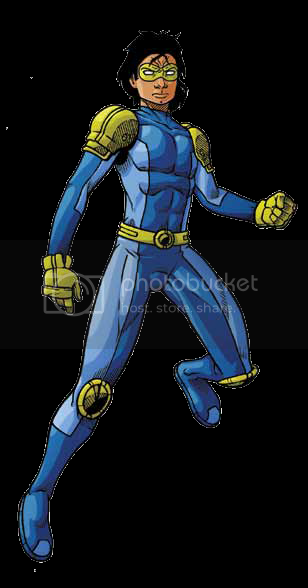 •Another follower of Kinematik, Raimundo Alvarez was once just the humble son of migrant workers, until his mutant powers developed when he was six. Able to mend broken bones and similar injuries, he was taken in by a roaming minister and became part of a folk healing show. 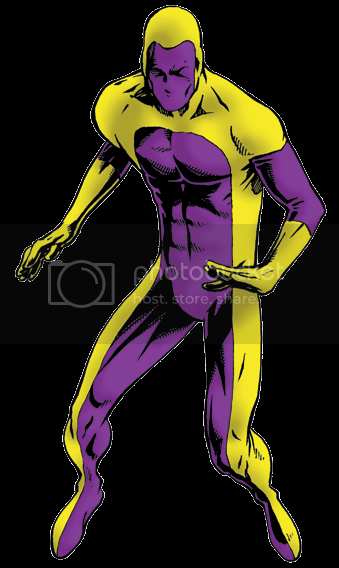 But a member of the Church of Seven Thunders showed up and accused him of being a mutant freak, organizing a lynch mob. Only the timely appearance of Kinematik saved him, and Fossil has become the man's most loyal follower. •Fossil has relatively unique powers (which is a welcome sight in the hordes of Champions characters) which make for a neat visual and slight change of pace. His claws won't get through most force fields or magic barriers, but he could break a high-Toughness, low Fortitude character's bones without much effort. His Transform can leave people crippled, and is mostly there to be used on NPCs to give them lasting injuries. I could have saved points by giving his points an array, but why bother since he's an NPC anyway. Fossil wasn't always a bad sort, but he was treated with contempt and hatred just for his powers, and now he's been twisted...into someone who hates normal people for their lack of powers. Unlike some of the others (Overdrive for example, is just a jerk), Fossil is one of Kinematik's followers, like the man himself, who can be used for a story about fighting fire with fire can be a bad idea for Our Heroes. Disability Bryan is blind, and while he can use his powers to makeup for this, it still causes him problems. Identity Bryan Lundquist's true identity as Blindside is public knowledge. Mutant Supremacist Blindside is not a nice guy to most anybody, but he especially hates "norms"
Wanted Bryan is an international supercriminal and on many watch lists. Greedy Bryan wants to live the high life, even more than he wants "norms" to suffer. Weakness Bryan takes 50% more of the effect from mental Damage effects. •Blindside is Bryan Lundquist, a guy who lost his eyesight and his parents to the same car accident when was 8. In and out of foster homes, he grew into a misanthrope, which wouldn't have been so bad had he not developed psionic powers. He soon became a supercriminal but was captured and spent three years in prison before Kinematik freed him and he joined his savior's cause. •Blindside is the worst of Kinematik's followers, suspicious, rude, mean to everybody. However, he's fairly powerful and can make a lot of trouble for any hero without decent will. 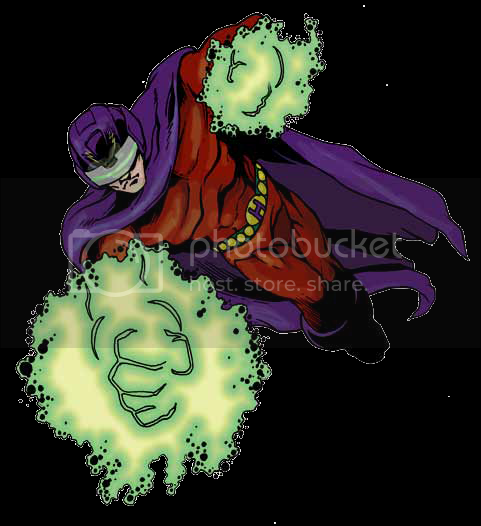 His powers range from outright mind control, to transferring his mind, to shutting down various parts of the brain to make his targets weaker, or blind (he particularly likes to do this and taunt people who now share his affliction), and he can get by by transferring other people's sense to his own, but this can confuse him in combat. Also, he can alter memories, but rather than add that as an AE, I figured it was just a function of Mind Control "Forget this ever happened", for example. Secret Geoffrey Haganstone hides both the fact that he is a supervillain and that he is a mutant from everyone. Temper If Geoff feels he's not being taken seriously, or is taunted, he can fly into a terrible rage. Wanted Holocaust is a well known and feared supervillain. No regard for life Holocaust kills others at his whims, even against his own interests. Megalomaniac Holocaust is convinced of his superiority and right to rule the world. •Geoffrey Haganstone has it all-money, looks, fame...and extremely dangerous superpowers. A metaman born to a pro-human politician, Geoff is considered to be a kind of pseudo-politician by many, he's got the brains and the money, but most aren't sure if he's got the instinct. Of course, Geoff would probably have more time to devote to politics if he wasn't trying to conquer the world as the supervillain Holocaust. With very powerful energy manipulating abilities, Holocaust is usually enough for the average superteam , and usually tries daring, "big splash" attacks like destroying the Empire State Building or Mount Rushmore, stuff that'll make him a real name. A pro-metaman, he has worked with other mutant criminals in the past like the Red King and Kinematik, but his ego ensures he'd never fully throw himself into such a cause unless he was the undisputed leader. A useful B-string master villain, he's no Dr. Destroyer, but he works just fine if your PCs aren't quite at the Justice League level. Arrogance Zaid is very overconfident of his strength, willing to take on nearly all comers. Wanted Zaid Kahil bin-Mahmoud is known as an international criminal, especially wanted by the US military. Temper Zaid sees insults everywhere, and doesn't respond to them well. Recognizable Zaid is heavily scarred, which can make concealing his appearance difficult. •Zaid Kahil bin-Mahmoud is a former Iraqi soldier, who joined the military after school simply because he hoped to indulge his sadistic tendencies. While his psychology was off, his biology hit all the markers for a super-soldier program. Zaid was the only success, and even he was badly scarred. Hussein made him his personal bodyguard, giving him his code name, which means "The Shield of the People". Following the Iraq War, Turs was elsewhere when Hussein was captured, and spent the next few years on the run, killing Americans-and anybody else he didn't like-when he could. Eventually, he established a network of mercenary contacts, and continues to operate internationally to this day, sometimes even on US soil. •Turs is a simple villain-he's an angry, super strong bully and cruel killer. Iron Age types should be happy tearing this guy apart, and even more 4-color heroes wouldn't think twice about dropping him in a hellish prison and calling it a day. He's a simple, but effective build not terribly strong as far as bricks go, but an effective grappler and able to Power Attack his way to rank 15 damage. He's tougher than he is strong, immune to small-arms fire, and is the kind of guy who will literally tear his way through a platoon of US troops, right before the PCs show up to stop him. No master villain, he can be used in connection with any foreign warlord type or domestic mercenary-anybody who has money and a violent job can hire Zaid. Yeah, I imagine that the presence of superhumans majorly affected the war in the middle east. Since I imagine everyone is scrambling to create or recruit their own superhumans. (And hey, I figured out how to use the auto link thing works, go me). Man, that's quite a name. I like it. I imagine there were are at least a few Iraqi supers who were against Hussein from the get go, so they were probably branded as dangerous criminals in Iraq. And I really wish the edit thread title feature was back. Have some upcoming builds I don't want people to miss. So instead I'm going to do my favorite character from one of my favorite guilty pleasure shows, The Originals. No one harms my family and lives. Family Man Elijah would do anything for his brother Klaus and sister Rebekah, from sacrificing his own life to murder. However, he often quarrels with them as much as works with them. Noble Elijah Elijah always keeps his word, and while he is a killer, he does hold himself to a certain standard of behavior. Relationship Elijah has very strong feelings for the werewolf Hayley Marshall, which is complicated by her being the mother of his brother's child. Secret In public, Elijah hides his nature as a vampire. Weakness Elijah is burned by sunlight unless he's wearing a certain magic ring, though it cannot kill him. Only a white oak stake can bypass his Immortality, but certain magic daggers can leave him comatose as long as they remain in his heart. Werewolf venom, while not lethal to him, is toxic and can incapacitate him for a short time in high enough doses. Vulnerable Elijah is not Impervious to magic attacks, and can sometimes be as vulnerable to them as a normal human. •Minor confession, I used to watch The Vampire Diaries fairly regularly, and now I watch its spin-off, The Originals and like it even more. Mostly because of Elijah. I think he's a great character because he has elements of both a classic hero and villain. He's brave, selfless, witty very devoted to his family, and has a certain sense of honor and class. Combine that with his power, looks, and resources, and he'd be an almost annoyingly perfect hero-except for all his flaws. He can be ruthless, deceitful, and has no problem killing people if he feels they deserve it. 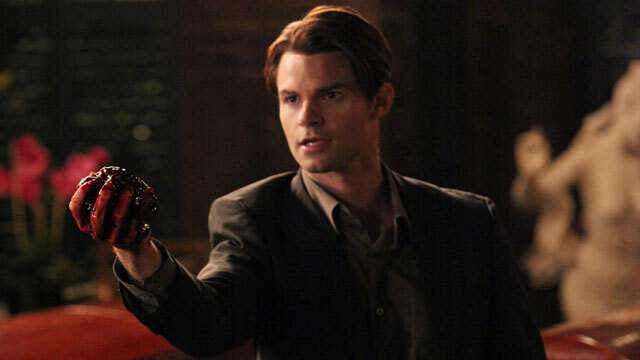 On The Originals, the main character Klaus is often both antagonist and protagonist, and Elijah as the secondary main character has many similar elements. A few characters have remarked that Elijah may have it in him to be as bad, if not worse than his monstrous brother-because his anger is cold and focused while Klaus just yells and snarls a lot. •In-universe, Elijah is one of the Original Vampires, first of their kind. He is basically like any other vampire, only more so. And unlike regular vampires who can be killed by several things (fire, magic, decapitation, staking, werewolf venom), Elijah and his siblings can only be killed by a certain kind of stake made from a rare tree. Its knowing that that made me keep Elijah's PL relatively low. For all his badassery (he has often beheaded people by karate-chopping them, torn people's hearts out like he was undoing a button, and at one point wiped out an entire small army of hostile vampires without any trouble), its mostly due to his indestructibility. He can use AOA and PA for +2/-2 to make him effectively a PL 9.5 on offense, and since nothing can really harm him, that'll be his default state-when Elijah decides to fight, its usually to kill, and kill quickly. Last edited by Arthur Eld; 05-29-2014 at 08:07 PM. For Love of Money K-OS is greedy, and loves accumulating money, particularly in digital formats. Wanted K-OS was built by a splinter group of the Japanese Committe, and they want it back. Appearance K-OS is a big, clunky robot with a large digital 'face' display. Going incognito isn't really in the cards. •A pair of super bank robbers, K-OS and Pandamonium are a dangerous double-act, but perfect for street level heroes and teen heroes. K-OS is a Japanese robot that is greedy in a way a human can never be, it simply loves money. K-Os is also somewhat naive, good at breaking into banks with its bare hands or its computer mind, but not much else. One More Score As much as he loves money, Pandamonium is really addicted to the rush of a successful crime. Wanted Pandamonium is a known and wanted criminal all throughout the US. Secret No one knows Pandamonium's true identity. Honor Pandamonium doesn't kill innocents. •Pandamonium is a mystery-did he steal K-OS, reprogram it, or just befriend it? Whatever the case, their pathologies dovetail nicely, they both love to steal. 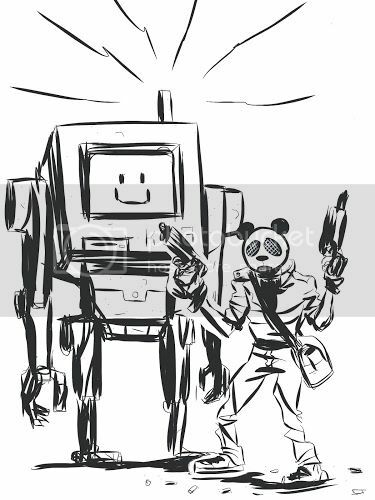 What is known is Pandamonium is a skilled marksman and has severely injured or killed nearly a dozen security guards and police officers on the pair's crime spree. Pandamonium is the one who plans the big scores, coming up with novel and inventive plans K-OS linear brain cannot conceive, but K-OS does most of the execution. Pandamonium is also well set up in the criminal underworld, with safehouses, thieves willing to take chances on him, and connections even with such groups as the remnants of the ICL and members of the Roman crime family. I like this duo simply because of their looks and punny names. Last edited by Arthur Eld; 05-17-2014 at 06:41 PM. Honor Green Dragon doesn't use weapons, fight women, or attack people from behind in most circumstances. Relationship Green Dragon is very close, and overprotective of, his younger sister. Bigot Green Dragon finds Westerners of all kinds to be lazy, sloppy, and distasteful. Wanted Green Dragon is a known and wanted criminal. Temper Green Dragon is usually an angry, mean person, but if his honor, fighting skills, or race are ever insulted, he becomes truly enraged. •Chow Deng was just a hardworking farm boy, living with his sister and parents, until his parents died when he was young. He and his sister lived with monks, who were training Chow to enter and win something called the Tournament of the Dragon. Eventually, Chow left the temple with his sister, impatient with his training and believing himself to America. His temper caused him to lash out-first at normal people, then at police officers, who he quickly dispatched. Until he was defeated by a superhero-which infuriated him. Impressed by his good showing against the hero, the local Tongs approached Chow and he began working for them. 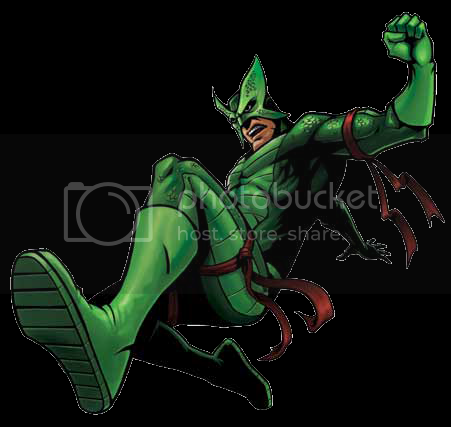 Enjoying hurting people and getting paid for it, Chow soon became a well-known mercenary villain, adopting a costume and becoming the Green Dragon. •Green Dragon is an unpleasant guy, and a classic martial arts baddie. He's not too into the mystic side of it all, he just likes to beat people up, and has mastered several mundane styles of kung fu. His sister serves to humanize him a bit, and PCs might even team up with him if certain criminals take her hostage to force the Green Dragon to work for them. Other than that, he makes an excellent foil for a Western martial artist type, and can be found whenever the GM needs a good mercenary criminal to throw at the heroes.